WCU EcoChecking includes a Mastercard® debit card. Buy what you want and get the cash you need. Wherever you go, Whitefish Credit Union's debit Mastercard® provides immediate access to funds in your Online Banking account. Leave your checkbook at home and get through store checkout lines faster. Withdraw money at thousands of ATMs in Northwest Montana and far beyond. Your Whitefish Credit Union debit card carries the Co-Op ATM Network logo, providing surcharge-free access at 30,000 ATMs, which includes 9,000 deposit-taking and 5,500 7-Eleven locations throughout the U.S. and Canada. Co-Op ATM members also have access to over 800,000 ATMs worldwide through links to NYCE, STAR, Cirrus, Pulse, and Plus. As you use your debit Mastercard® daily, track your activity online. 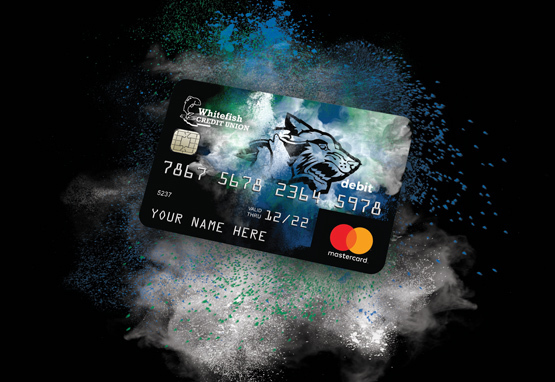 Celebrate your school pride with School Spirit Mastercard® Debit Cards. We'll donate $5 to your school when you apply for the card. *The Co-Op ATM Network provides access to over 30,000 ATMs nationwide but does not include shared branches.